"You cannot say that you have been to Bali if you haven�t gone to Jimbaran Bay for the seafoods! 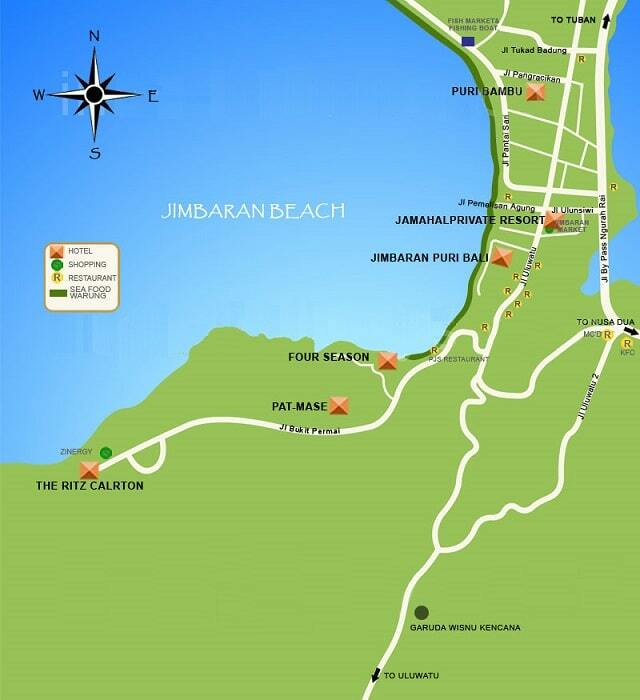 Jimbaran is located in the South of Bali, in between Kuta and the Bukit. It is around 15 minutes drive from the airport & 20 minutes from Seminyak when there�s not much traffic." Jimbaran located just south of the airport and Kuta. This was formerly a real backwater of south Bali. It was just a small fishing village with a daily market. All that began to change in the 1980s and Jimbaran is now home to several world class 5 star beach hotels, plus a few more middle class hotels resorts. However, there's no budget accommodation, but there are beautiful villas around Jimbaran. Especially on the ridge above Jimbaran Bay. This has resulted in the locals nicknames such as the "Beverly Hills of Bali" or "Millionaire's Row". The bay itself has a pleasant white sand beach and is very safe for swimming. The three clusters of grilled seafood restaurants on the beach are a major tourist attraction in the evenings. Especially when sunset in its fullness shows. Jimbaran is also home to a Norwegian University, Gateway College, where about 500 students of philosophy, athletics, culture, economics and journalism are studying. The school is located in Kedonganan near Sari Segara Resort and Jalan Bantas Kau, where it also has a small cafe. Jimbaran has an increasing number of fairly upscale shops, but there is little or no nightlife. It does have the advantage that it is close to Kuta and Seminyak and other cultural highlights of Central Bali. 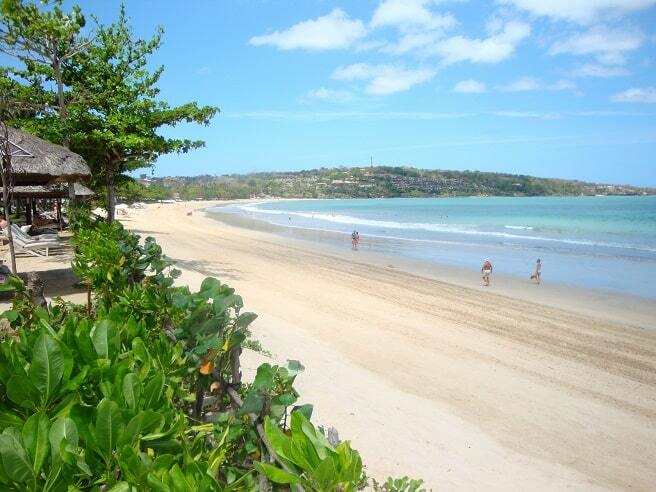 Jimbaran Bay has one of the best beaches in Bali. The sand is fine and white, and the calm waters make it very suitable for swimming, for both children and adults. The southern end of the beach near the Four Seasons Resort is the quietest, but the entire beach is very pleasant. You can best take place about five hours in one of the restaurants on the beach, order food and drink and enjoy the romantic sunset while you wait for your order. The sunsets in Jimbaran are very beautiful. There is a traditional fish market on the north side of the bay, directly on the beach at the junction with Jalan Tukad Ayung. The catch comes in every morning to land and the customers are usually the buyers of the best restaurants in Bali. All kinds of fish and shellfish are for sale. 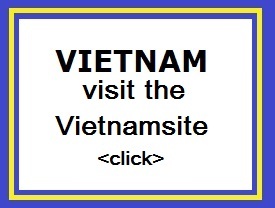 The best visiting time is between 6:00 a.m. to 9:00. 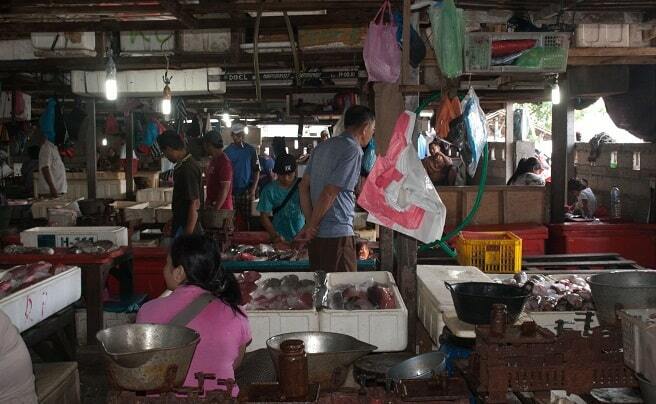 It is also possible to have the purchased fish prepared in one of the many "houses" in the fish market. Jimbaran is a typical small Balinese society with many small streets and alleys. It is a perfect place for a stroll. You can just walk around in Jimbaran, this is an adventure. When you walk through the many narrow streets, you will see how the locals live in Jimbaran, which is an attraction in itself. The locals are welcoming and do everything with a smile. The road along the beach and Jalan Uluwatu are good landmarks. This perfect villa is just within 50 meters from Jimbaran Bay Beach and neighbor to the famous Jimbaran Seafood Restaurants. Jimbaran Bay Beach Residence offers a fine list of room accommodations ranging from modern sea view villas to thatched private pool villas. Guests will not find any other venues within Bali's Golden Mile that has private villas sitting this close to the beach. With a full range of popular amenities, friendly staff, and an ideal price range, it is no wonder guests keep returning to Jimbaran Bay Beach Residence.